It is common that iPhone users accidently deleted their iPhone message in their daily life. No way to recover lost data from iPhone 6, iPhone 5s/5c, iPhone 5, iPhone 4, iPhone 4s or iPhone 3GS? Of course there is. Actually, you can find back your messages, pictures, videos, contacts, calendar, notes and call history, etc, when you accidentally delete them or just lost the iPhone 6/5S/5C/5/4S/4/3GS. To recover and extract deleted iPhone SMS, you need a more reliable tool. 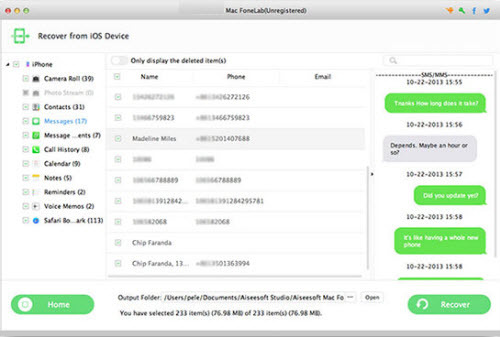 Download UFUSoft Mac FoneLab (For Windows: UFUSoft FoneLab) and retrieve deleted text messages on Mac or Windows safely and conveniently. In fact, you have two useful ways to retrieve your iPhone 6/5S/5C/5/4S/4/3GS SMS messages: Recover messages from iTunes backup and Recover the messages from iPhone directly. Keep reading the detailed steps below. Alternatively, if your iPhone 6/5S/5C/5/4S/4/3GS is not at hands, try the other way. As long as you have backed up iPhone with iTunes on this Mac or Windows, there are backup files in your local disc. But they cannot be opened directly. 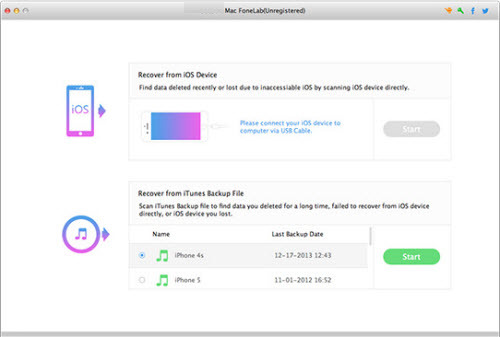 UFUSoft Mac FoneLab or FoneLab helps you to extract deleted files from iTunes backup. 2. In the main interface, choose “Recover from iTunes Backup File” mode. All backup files will be loaded automatically to the program. Check the one and click “Start”. Note: If you click the button directly without choosing file, UFUSoft iPhone SMS Recovery Software will scan the first file in default. 3. After scanning, all the data in this file will be scanned out and listed under separate categories. Uncheck the device and tick Messages. Choose the messages you need and click “Recover”, they’ll be extracted to the certain output folder. If you got nothing in the iTunes/iCloud backup or Spotlight search results, don’t despair. The deleted files can be retrieved from your iPhone 6/5S/5C/5/4S/4/3GS directly. 1. 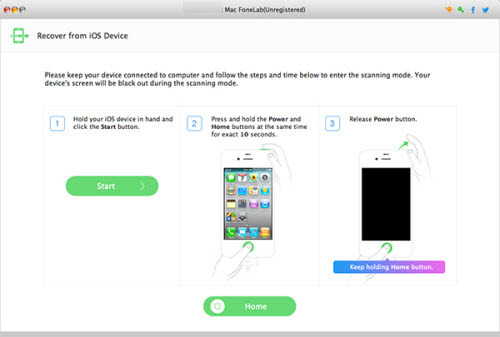 First you need to download and install UFUSoft iPhone 6/5S/5C/5/4S/4/3GS SMS Recovery tool step by step. 2. Connect your iPhone 6/5S/5C/5/4S/4/3GS with Mac or Windows via USB cable. 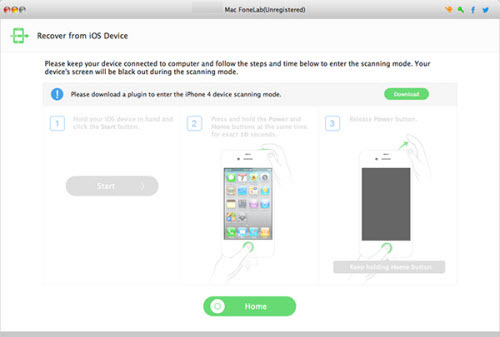 For iPhone 4 and 3GS users, please download a plug-in and follow the instruction on the interface to start scanning. For users of other iPhone types, click Start and the scanning will start directly. 3. After scanning, all the files will be listed under separate file types. Uncheck the name of your device then click Messages. Check what you need one by one and click Recover. All these files can be extracted to the specific output folder you set.